MassActive needed a fun way to showcase a client’s success story. Traditionally case studies are fairly dry; I wanted to create something engaging that encourages viewers to read the content. 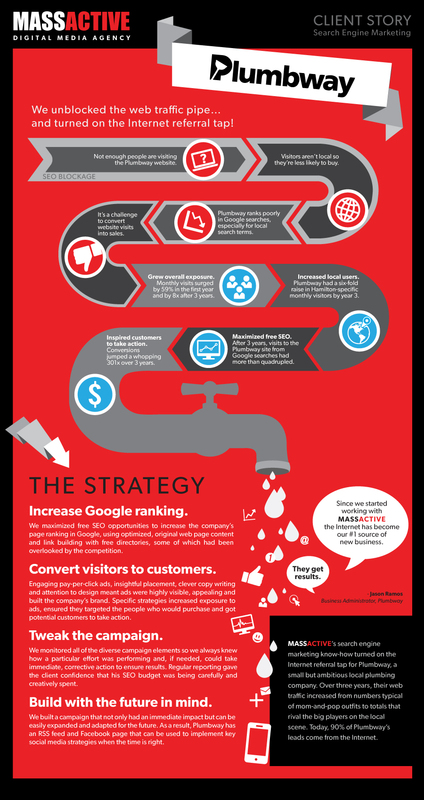 The theme was to visualize the “SEO tap” being turned on with increased internet revenue flow, which plays off their position as plumbing experts. I created a bright and modern illustration that walks the viewer through the process of how one company dramatically increased SEO results using services from MassActive. This piece is used for both web and print promotion. See it online.